I would like to know if there are any clear distinctions between "a forest path" and "a forest trail", in general ? Or what does the two words respectively evoke to you, generally speaking ? A path would be a natural path caused by humans and/or animals walking along it. It would be narrow and completely unsuitable for horses or vehicles of any sort. A trail can be a well-established path, sometimes repaired or improved by workers. It is almost always wider than a path and may be (in sections or overall) suitable for horses, bicycles, and perhaps vehicles. Out here in the forests of the Northwest, it's not quite that cut and dried. For example, we talk of "game trails," created by deer and other animals and so narrow that they are nearly impassible to humans on foot. I have a couple of "trails" on my property that certainly are not suitable for bicycles or other vehicles. On the other hand, we have "paths" in our parks out here. They are well-maintained, rather wide and frequently paved. 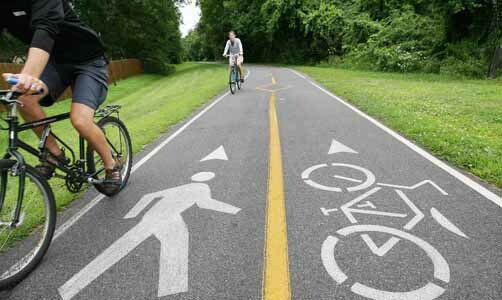 See, for example, this photo of a bicycle path. It's just not that well defined out here. Once we move out of the forest, things do become more complex. There are "nature trails" that can be both well kept an maintained or little more than a muddy line through grass and brambles. In the UK, this sort of "trail" has a nuance (usually for the purpose of building up public interest and that of teachers leading groups of children, etc) of "going into the wild" - a thing that is difficult on a small overcrowded island. Again, out of the forest, paths abound in urban parks, etc and are almost invariably metaled and some could support smaller vehicles.